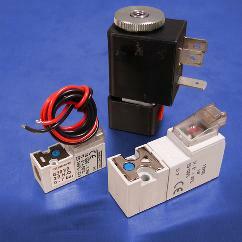 A solenoid valve is an efficient method of converting electrical signals into pneumatic functions. Applying electricity to the solenoid quickly directs air through the valve and into the circuit. Pneumadyne’s direct acting pneumatic solenoid valves are a cost effective, space saving solution for the use of single or multiple valves. 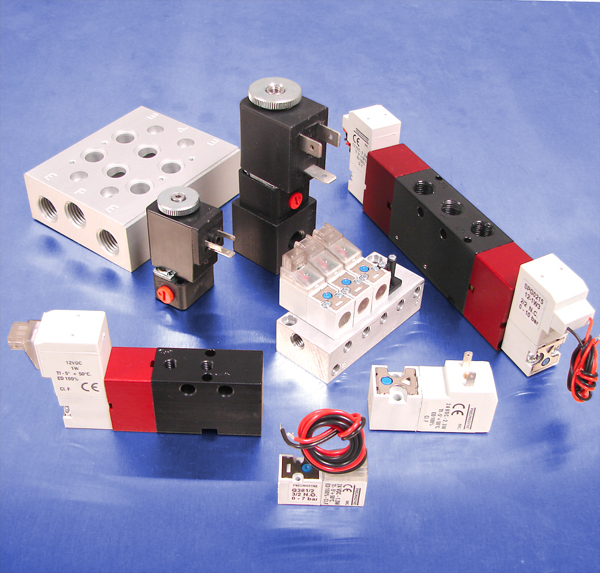 Our versatile offering features a variety of voltage, wattage, connector, and mounting options to make the selection and installation of your solenoid valves fast and easy. Quick response times and high flow rates make our pneumatic solenoid valves suitable for numerous applications. Request a quote on the pneumatic solenoid valves you need, or contact Pneumadyne for more information. This miniature solenoid valve has an overall length of 1.08” and height of .52” making it the ideal choice for applications where space is limited. Our 2 Way and 3 Way solenoid valves feature three connector options, leads, and plug-in connectors, to simplify installation. This versatile pneumatic solenoid valve offering includes 12 & 24 Volt DC and a low watt 24 Volt DC. A 15 mm direct acting solenoid valve features a variety of connector, electrical, and mounting options to accommodate a variety of system requirements. 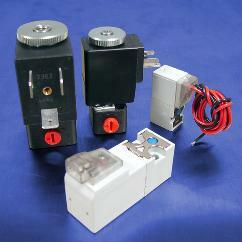 2 way and 3 way solenoid valves are offered with 12 Volt DC, 24 Volt DC, and 110 Volt AC coils. Three orifice diameters (0.8 mm, 1.1 mm, and 1.6 mm) are available to fit flow rates to your application specifications. Pneumadyne’s System 6 solenoid valve features a wide variety of voltage options, including a low watt version (0.8 watt) that is ideal for low power control circuits. 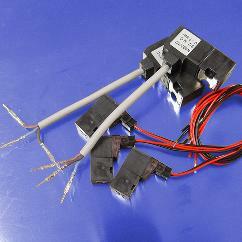 These 2 Way and 3 Way Normally Closed solenoid valves are available with Spade and Flying Leads Connectors for fast electrical connection. The system 8 solenoid valve features a larger orifice for applications requiring higher flow rates, 6.2 to 9.0 scfm at 125 psi. These 2 Way and 3 Way solenoid valves are offered with a Spade Connector and 12 Volt DC, 24 Volt DC, 110 Volt AC, and 220 Volt AC coils to accommodate your fluid handling requirements. A latching solenoid valve is recommended for applications where power is limited or coil heating is unwanted; continuous power is not required to maintain the energized position. 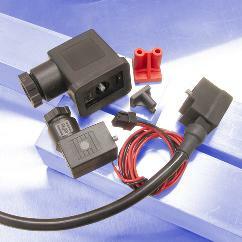 The 15 mm solenoid valve option features a 3-wire system, therefore, a relay is not required to reverse polarity. Fast response times allow for a momentary pulse to energize and de-energize the valves. 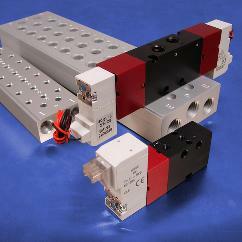 Pneumadyne manifolds are a cost effective solution for mounting multiple solenoid valves. Single to 12-station manifolds are available with a 10-32 (F), M5 (F), 1/8 NPT (F) or ¼ NPT (F) threads for plumbing convenience. 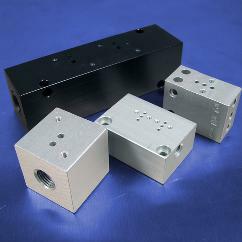 All bases and manifolds are clear anodized for corrosion resistance. When used in conjunction with our bases and manifolds, a Pneumadyne solenoid valve is the ideal interface between your pneumatic and electrical systems. Contact Pneumadyne for more information about our pneumatic solenoid valve options. Don't see what you're looking for? Contact us to discuss your custom requirements. Pneumadyne is a manufacturer of standard miniature pneumatic solenoid valves. We can also assist you with design and engineering of custom pneumatic components or full pneumatic control systems.